In the following chapters we will use Ardour to create a short rhythmic passage using several drumkit samples. We will continue working on this passage in later tutorials, such as Working with Regions and Creating Looped Sections. We assume that you have read the chapters in the Getting Started section already, and are familiar with Importing Audio, Tracks and the Timeline. 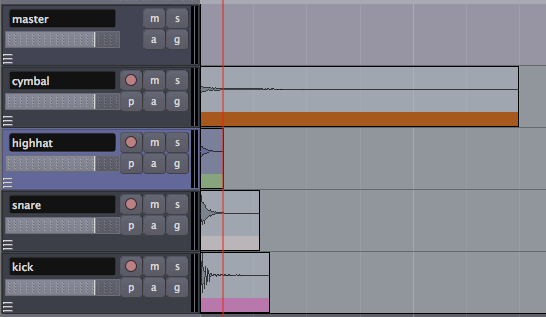 The first step is to add some sounds, which is discussed at length in the Importing Audio chapter. 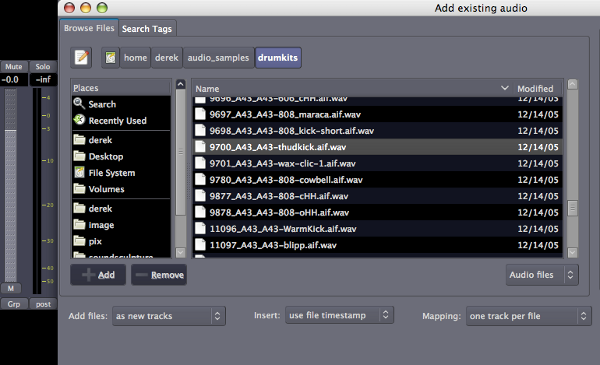 Here, we are using the Add existing audio dialog to embed some drumkit samples as regions. Note that each new audio file is added "as new tracks" in the menu option at the lower left. The samples used in this tutorial were downloaded as a sample pack from the freesound.org website. The drumkit samples will appear as new individual tracks in the Editor Window, each with the name of the audio file used. Now we rename the tracks so we can quickly see the location of each instrument. 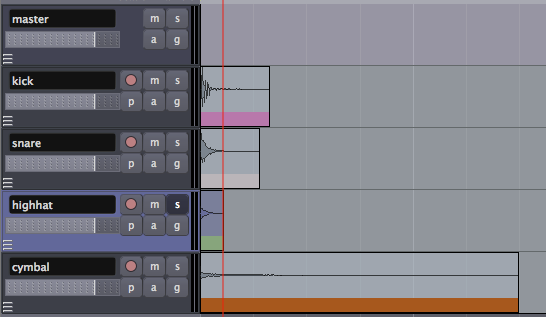 You may also wish to rearrange the order of the tracks from top to bottom in the editor window. 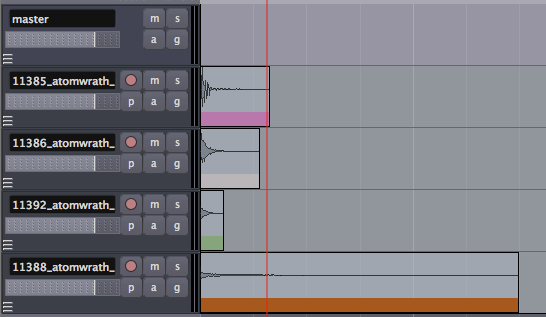 Do that by clicking the Tracks/Busses Tab at the far right of the Editor Window and drag-and-dropping the tracks in the order you want. 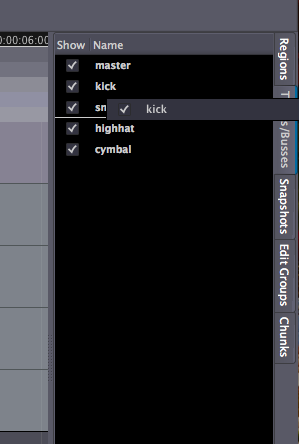 Tip: you can also use the check boxes in this tab to view or hide Tracks in the Main Canvas. Here we have ordered the drumkit so that the kick drum is on the bottom, the snare and high hat are in the middle, and the cymbal is on top. In the next step we will learn about Setting Up the Meter to organize these samples into a rhythm.